Sometimes simple is best. Roti prata, a popular Singapore hawker dish imported from South India, is a deliciously buttery flatbread served with a bowl of curry. It’s equally popular for breakfast or a midnight snack, and is one of the few hawker dishes that is easily made vegetarian. Roti prata: So simple, so yummy! 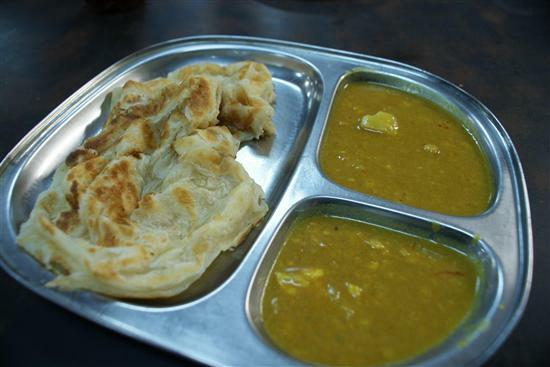 Roti prata (called roti canai in Malaysia) may look like a pancake but is usually a savoury snack. The dough is repeatedly kneaded, stretched, and folded so it’s light and airy, and it can be just as much fun to watch the roti being made as it is to eat. When the dough is just right, it’s slathered in ghee (clarified butter) and put on the grill. The perfect roti prata should be crispy on the outside but soft and chewy when you pull it apart. Essential to the roti experience is the bowl of curry to dip it in. At Malay restaurants the curry is made with chicken or fish, but at vegetarian restaurants in Little India it’s always a serving of dahl (lentil curry). As is traditional in South India, roti is usually eaten using your right hand. The simplicity of roti prata has inspired many variations and you can jazz up your roti with egg, onion, cheese, or stuffed with minced meat in a creation called roti murtabak. Casuarina Curry is known for offering more than 40 types of roti including a pizza-like roti with mushrooms and sausage and dessert roti with chocolate.